When you think of taking a break from your routine and plan an outing, you have certain fixed notions in your mind. 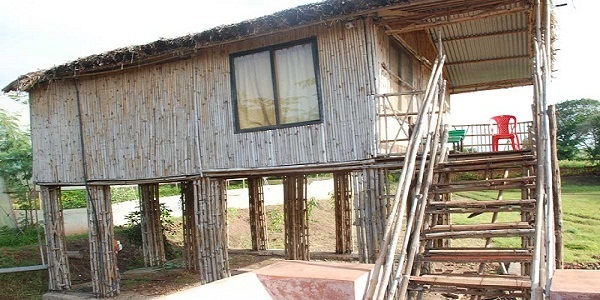 You draw up a mental picture of a god hotel or resort with five-star facilities. You would think of a swimming pool, spa, gym and sight- seeing. However, these things have become commonalities. Even the breaks become dull when there is no novelty. Change does not always imply luxury, comfort and good food; in fact, you enjoy these facilities at home round the year. A good change in the routine must offer a complete change of scene. If you want a real, refreshing, vital change, you are welcome to Morachi Chincholi. What is so different about Morachi Chincholi ? Here you don’t travel in comfortable cars and jeeps to watch points and valleys from binoculars. Here you travel in noisy tractors in farms. 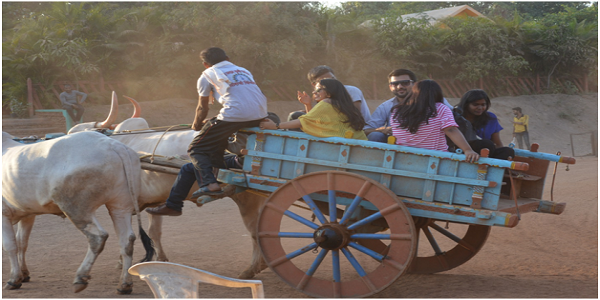 Alternatively, you can choose a bumpy bullock-cart ride on rough village tracks. The sight- seeing spots consist of temples and green pastures. 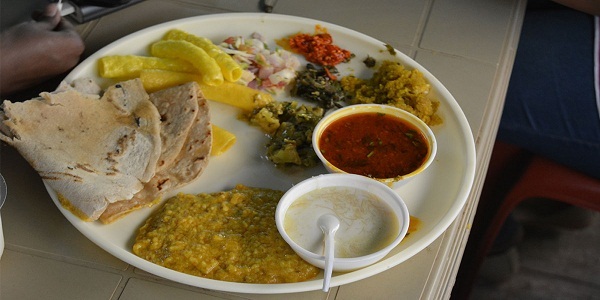 At Morachi Chincholi, you will get the usual South Indian, Punjabi, Gujarati, Continental food; but what you will love is the taste of bhakri, pithla ( Zunka) and burning hot red or green chatnis to go with vegetarian or non-vegetarian options, all prepared on chulhas in the rural style. You will end up smacking your lips and with watering eyes. Morachi Chincholi is not that comfortable, luxurious, elegant, cool, artificial hill-station experience; it is a hard, hot, realistic rural experience. At Morachi Chincholi, you will not get a chance to on a shopping spree in crowded market places selling clothes and bags and jewelry at exuberant prices. Here you can take a walk through farms and fields and watch the blue skies above and green fields beneath, with hills and mountains at the borders. Trees, birds and animals have nothing to take back except wonderful memories of a special holiday. And now we come to the climax. 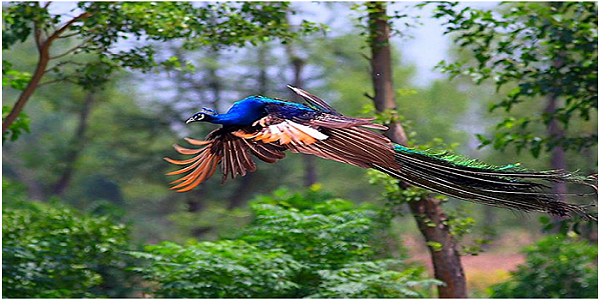 What makes Morachi Chincholi different from any other place in the world is that the village is an abode of peacocks, our national bird. You can see hoards of them when you step out of your rooms. Their peacock cries hail you; their colourful plumes attract you. And if you are lucky enough and don’t miss the rainy season, you can see them dancing gracefully in the cloudy weather with their beautiful wings spread out with vibrant colours. So Morachi Chincholi will be a special break from your routine. 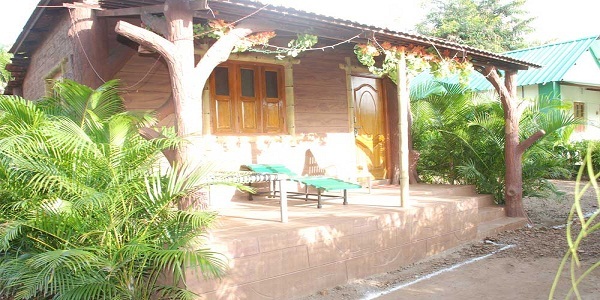 It is at a convenient distance from Pune, Mumbai and Ahmednagar and an ideal spot for a monsoon weekend. You will not carry back trinkets or a lethargic feeling; but you will return to work with vigour and energy, refreshed in mind and body and carry back unique memories of green farms, farm animals, rough rides, rural cuisine and exotic peacocks. Most companies and schools have five days week as per the trend, allowing a weekend to stretch from Friday afternoon to Sunday evening.The schedule during the week is so hectic that week after week of hard work wears out a person mentally and physically. Once in a while, it is necessary to detach yourself from the work scene and enjoy a little change and fun to keep your spirits high. All resorts and picnic spots are not suitable for families; especially, when there are kids, there has to be provision for comfortable lodgings and good food. Besides, it is not advisable to travel very far during a weekend; a lot of time and energy is spent in travelling and the journey adds to your fatigue. So if you are looking for a suitable place for a fun-filled weekend with your family, the ideal spot is MorachiChincholi. 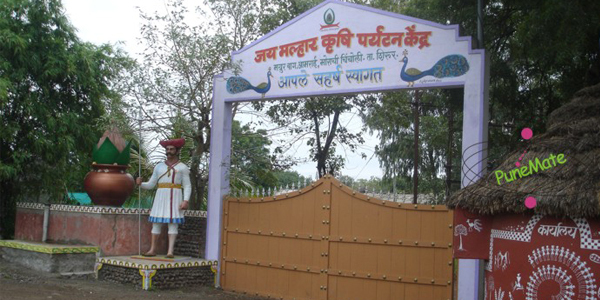 ‘Chincholi’ is the name of a village situated on Pune-Nagar road. 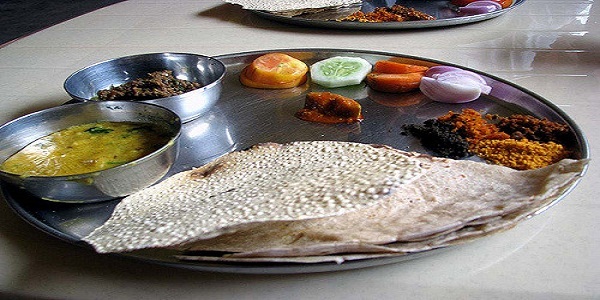 It is at a convenient distance from Pune and Nagar, as well as from Mumbai. 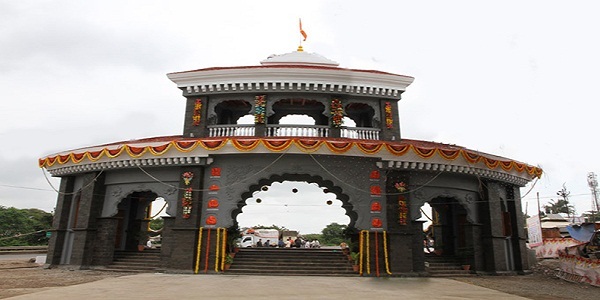 It can be reached quickly from Mumbai via Chakan-Talegaon road. Hence, one need not travel long distances to reach a heavenly resort. There is something special about this place; of course, it has everything that you expect in a good resort, like comfortable accommodation, AC rooms, multi-cuisine restaurant etc. 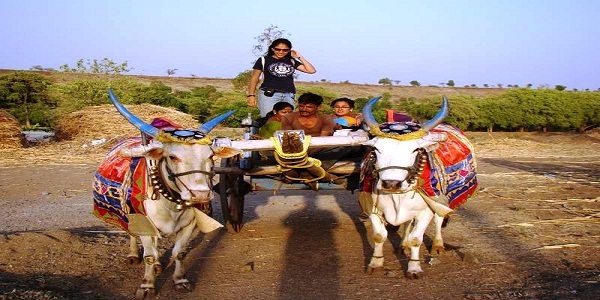 The village gives you a rural experience and tractor rides and bullock-cart rides add value to it. There are a few interesting picnic spots and temples nearby, where you can go easily. But what is so unique and special about MorachiChincholi? 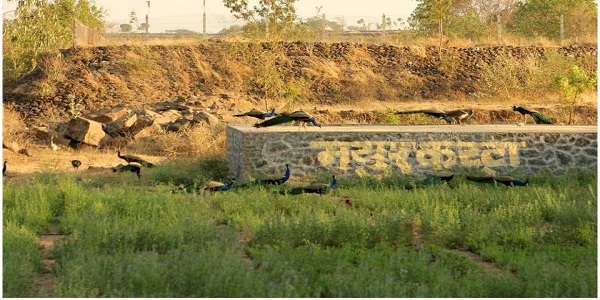 “Mor’ In Marathi means ‘peacock’. MorachiChincholi means Chincholi of peacocks, that is, a village of peacocks. 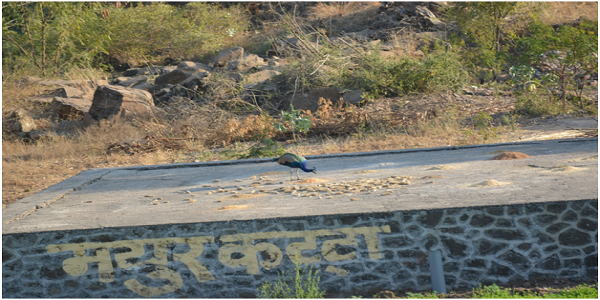 There are flocks of peacocks all over the village and you can see them at close quarters, feed them and interact with them if you are lucky enough. This is a special attraction of MorachiChincholi. People from far away visit the place to be among peacocks, and by the way, it is our national bird. 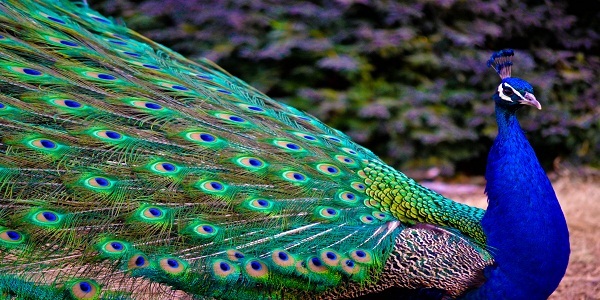 These peacocks are enchanting for children and adults. So? What are you waiting for? Book for this weekend so that you don’t have to regret. This is the ideal season for visiting MorachiChincholi. 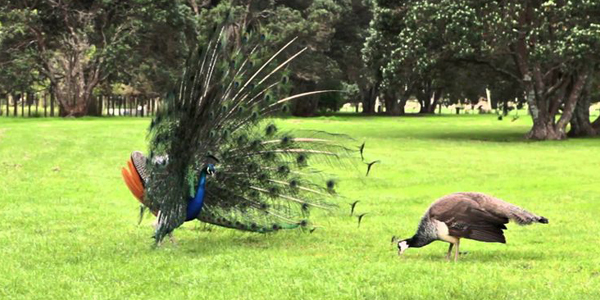 It is the rainy season and you know that peacocks love rain. They spread out their beautiful vibrant coloured plumes and dance gracefully, moving backwards and forwards. Surely you don’t want to miss this rare and wonderful sight? 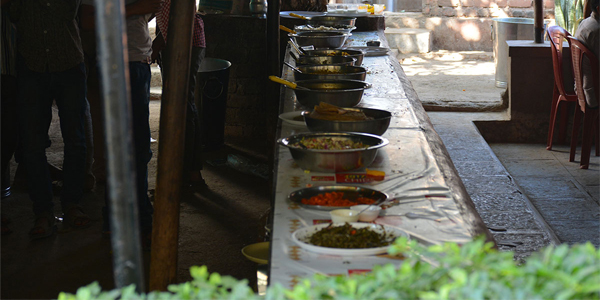 We await your arrival at MorachiChincholi and we shall be glad to serve you to your satisfaction. 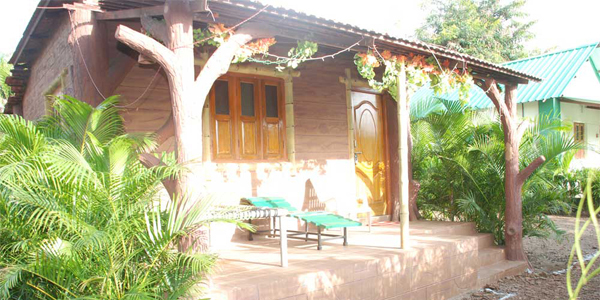 Give your family a real pleasant holiday airing at Morachi Chincholi– you deserve it. Human beings are made of flesh and bones and they have a heart pounding in their chest cavity. Humans have a mind, a soul and they can think and feel. Human bodies and minds have to be maintained in order to function well throughout life. The problem is that we humans take our minds and bodies too much for granted; driven by responsibilities and challenges we put too much pressure on ourselves. We stretch our capabilities beyond limits, and some day we pay for it in terms of pains and aches and diseases. 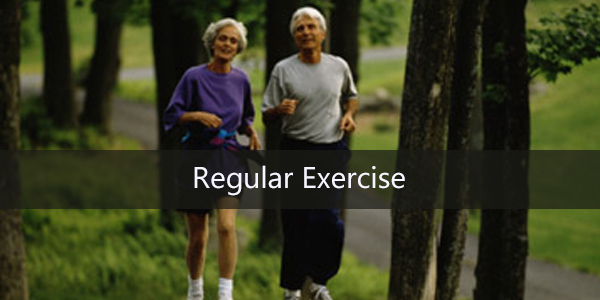 Taking regular exercise, eating nourishing food at regular times, consuming sufficient water and maintaining cleanliness and hygiene are very important things that enable us to remain physically healthy. However, physical health is not enough. 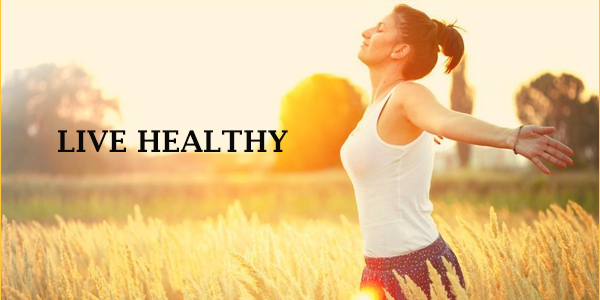 There should be a healthy and balanced mind inside a healthy body to maintain overall stability. 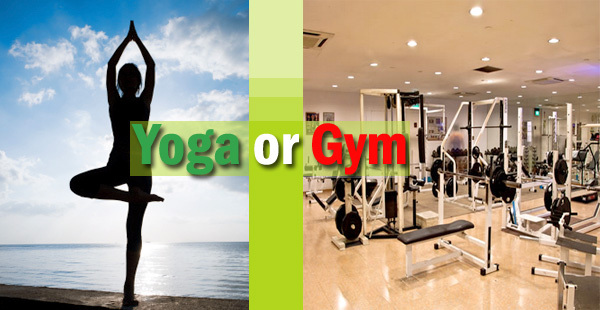 Gym, yoga, exercises are practiced by people who are aware of the importance of health. The greatest challenge lies in maintaining a healthy mind. The cut-throat competition, growing challenges, increasing responsibilities, deadlines and targets are typical characteristics of workplace that draw upon mental energy and exhaust people mentally. As a result, people become victims of frustration, depression, stress, lethargy, loss of enthusiasm, negativity, withdrawal from society and various types of addiction. Mental diseases can further develop into psycho-somatic diseases like tumor and heart diseases. It is thus important to keep your mind healthy so that you can manage daily routines and workplace challenges competently and carry out your responsibilities. It is said that change of works rest. So change the type of work that you are engaged in offers some relief. For example, if you have to tax your brains to tally account figures, work on them for some time, then wind it up and switch over to the power point presentation that you left incomplete. You can continue to match figures the next day. If you feel too tired and exhausted, you can take the liberty of a power nap occasionally. One thing that exhausts you is a set routine: you go to work at the same time and place every day, you sit at the same table among the same people and do the same kind of work for days ad months. This can really bear on you seriously. So you must break the routine. You deserve to take a break at regular intervals. A real break from the routine means going to a different place, do something that you like and enjoy, go among different people and use your time in your own way. Get up whenever you want to or sleep at odd hours if you need to. Eat a variety of food to tickle your taste buds. Forget work, forget the workplace, and don’t think of it. This can only happen if you transport yourself to different, unfamiliar surroundings where there is nothing that would remind you of work. We invite you to try Morachi Chincholi. 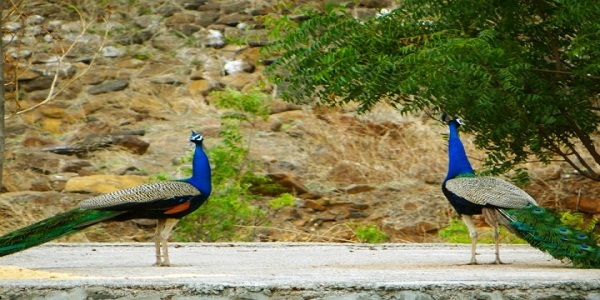 It is a small village that is famous for being inhabited by hundreds of peacocks. 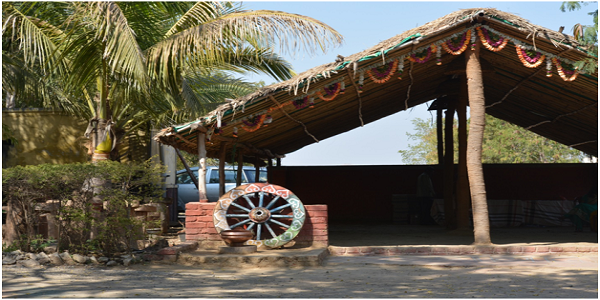 You get a feel of rural life, at the same time, the luxurious resorts offer comfortable living quarters with all modern amenities and facilities including a variety of food. 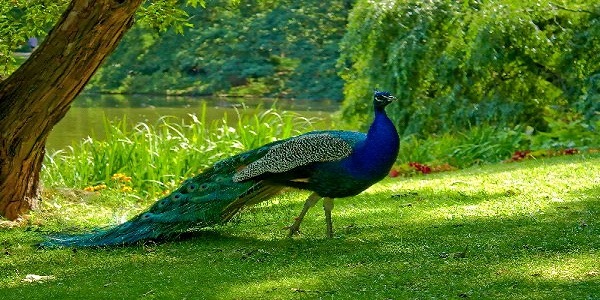 You will be so engrossed in watching peacocks and being amongst them that you will completely forget work and responsibilities and get a break in the real sense. You can rest, take pleasant walks, go sightseeing and enjoy a short holiday. Even a weekend at Morachi Chincholi is a rejuvenating experience that will raise your spirits and recharge you to face the work challenges that await you back home!!! You deserve the break after a long time of hard work – so go ahead and pamper yourself. Wish you a happy weekend at Morachi Chincholi !!! Just leave your place and be ready with the weekend planning. You need not to stressor tensed so much because here is the best option for you which is very near from the Pune. Don’t waste your time on thinking so much and come to Morachi Chincholi on this weekend.Mayur Baug at Chinchli Morachi is managed by Jai Malhar Krushi Paryantan Kendra and this place is more awesome than your expectations. The Morachi Chincholi is just a 50 km away from the city Pune, but it is totally surrounded by the awesome shades of nature. Here, you can see the garden of tamarind trees and many other varieties of trees and shrubs. You can smell the rural life easily here and you will go more and more closer to the nature. Everybody is looking for a break from the hectic routine of city life and often it is not possible to take a long vacation. A day trip in the rustic village surroundings provides the right change required to rejuvenate and face the city life with a new zeal. 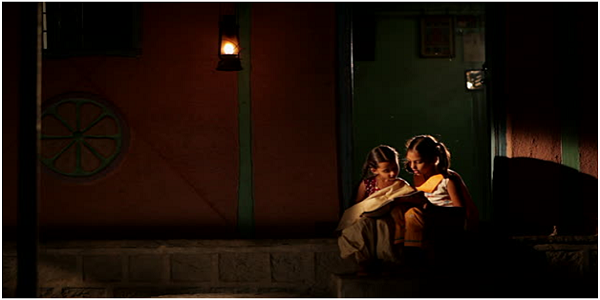 Experience the wonders of pollution free air and in the heart of the rustic village life. ChincholiMorachi is one of the restful villages and you will experience the contrast life of the city here. The serenity of the village gives peaceful life to the wildlife and because of it you can experience the bird watching here. 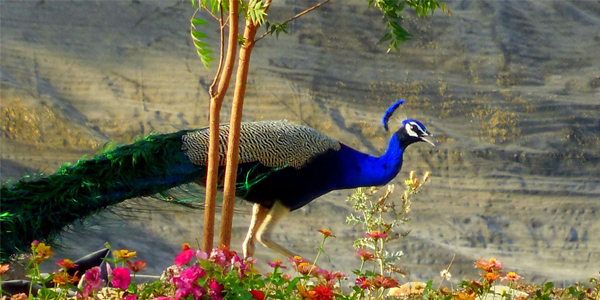 ChincholiMorachi village is famous for the presence of peacock, they gambol audaciously. 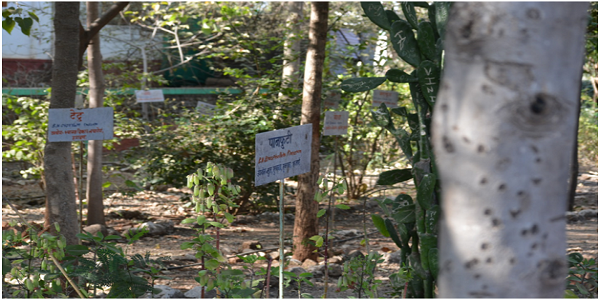 Morachi Chincholi is an organic farm so it is a very appropriate place for the planting. 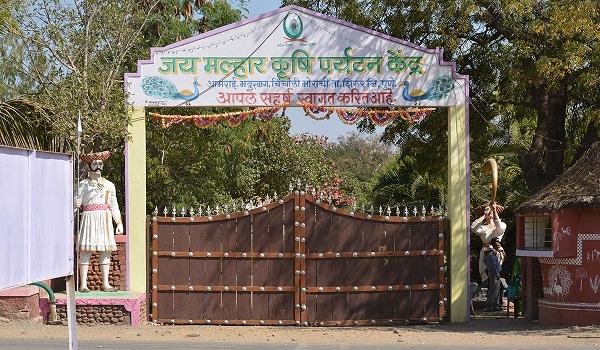 This place gives effective results through farming. A full fledged nursery shows you a variety of flowers and plants grown with care. Even though you will get all details about the particular plant and also you can experience how should we take care of the farms with proper orgaic fertilizations. You can play all type of games which you might be played at your childhood and it will help you to recall your memories. These games include gillidanda, marbles or rural games and it will help you to relieve your stress. This is the overwhelming thing if you stay back for the night then you can enjoy the peace of rural evenings under the dim lights of the kandil(lantern). This light will help you to talk with yourself, that means you are actually spending the time with your self only. With this night you come to know that, how the actual rural night is? 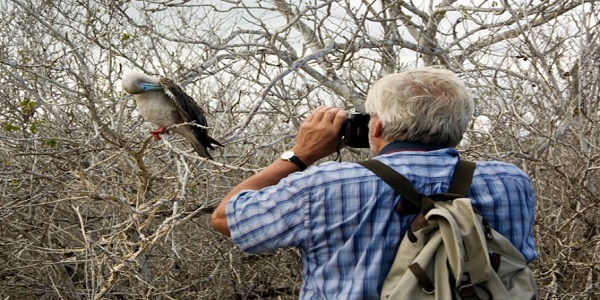 This place talks about more things, you should visit this place and take an experience!The Indian National bird is not a newcomer at Morachi Chincholi Villagers claim that even their ancestors co-habited with these birds and the tradition has survived and flourished. It is believed this village is now a home to over 2,500 magnificent winged beauties. 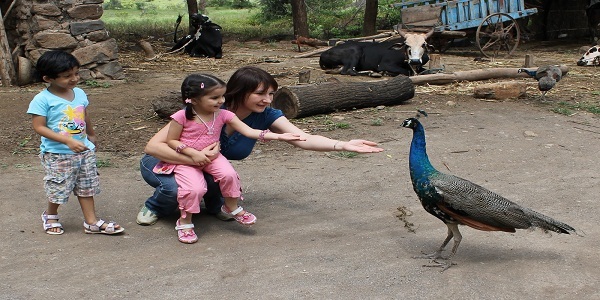 MayurBaug is your ideal destination for a day trip to see the glorious birds in their magical splendor and in abundance. 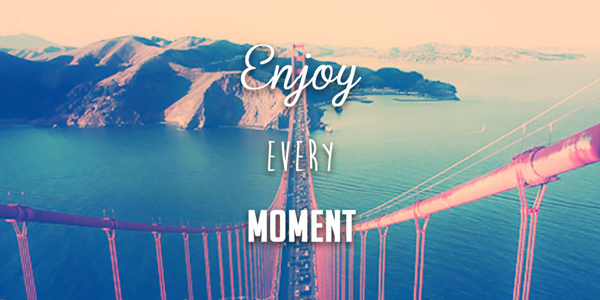 Visit this awesome weekend destination and make your day!